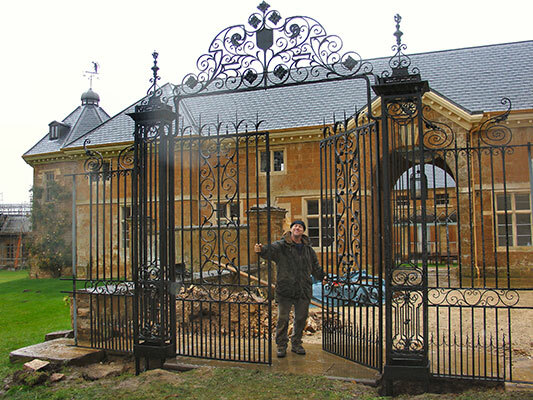 At Black Forge, our experienced, dedicated blacksmiths and designers have an extensive range of technical and artistic expertise which enables us to offer you a unique and complete service including, project discussion, designing, planning, manufacturing, delivery and installation. From large signs and weathervanes, large double entrance gates to small single garden gates, railings, rose arches and all garden structures, we offer the full, design, manufacture and installation service. All our work is designed and installed to your requirements and specifications, leaving you to appreciate, enjoy and use your uniquely hand forged creation for many happy years, - satisfaction guaranteed. The photographs on this page illustrate a couple of particularly complex installations which are documented below in the gallery photographs. Firstly, (to the left), having designed, manufactured and installed many village signs over the years, usually on the village green or by the road side using two or three men, appropriate hand tools and some scaffolding, occasionally a large, in this case Croydon Council, commission comes our way that requires a lot more planning, organisation and heavy machinery. Following the photographs and captions below will hopefully give a pretty accurate picture of this process. Secondly, (above), gates and railings will always need to be installed following their manufacture in our forge and we have dug many holes in many customers’ gardens over many years to receive these. The photograph above shows the almost completion of a particularly large and ornate pair of gates with iron supporting columns and a large ornate arch containing the family crest spanning over these. Again, heavy lifting machinery was required, but again, this is a pretty extreme example of a gate installation and the gallery below as well as documenting this project also shows several other less complex installations. A large village sign with a design requested by the council hot off the bench in our workshop. Galvanised, powder coated black and the finishing touch name being applied in 22 CT. gold leaf. Up to London we go with Rod and Josh posing on the back of a large lorry with HIAB crane. Parked up and cordoned off on the designated street corner. Getting a ton of oak post into the hole. Making sure its perfectly vertical. A final tweak while George finds time to pose for a photograph. Up and over the post she goes. 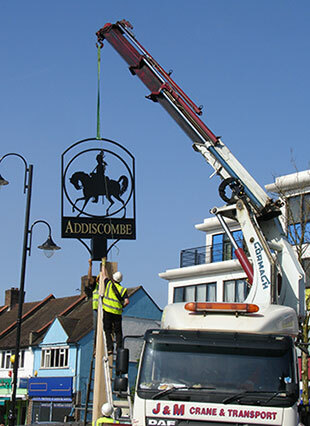 Precision crane operating as the sign is gently lowered over the post. Screwing the sign onto the post. Almost there as the weight is taken off. A more typical rural roadside village sign placement. Another more typical village sign location. Finishing touches to a sunny summer's day installation. Upon arrival, at a customer's house to install some gates, following measuring, checking and levelling, - holes firstly need dug. Some digging (and some laughing because they're not digging). He's only pretending that the hole's that deep (1). Heavy supporting steel beams are dropped into the holes, perfectly aligned with each other and backfilled with concrete. The gates are then hung off extended arms from the upright steel beams. In this instance the customer also wanted a smaller side entrance gate alongside. This customer grew prize winning flowers and wanted some roses included within the gate's design. Rose on the end of a scroll feature. Close up of one of our hot forged roses. Freshly installed and standing back to admire them. This is the arrival of our large sign panel designed to go over the entrance gates to a children's park in London. The installation of this large arch again required lifting machinery. Nicely installed sign arch above gates with pretty spring blossom trees behind. These supporting columns were the beginning of a four installation of a large and ornate set of historical gates. With the ornate columns positioned the gates are laid are out and ready to lift. Gates in position and a tricky final heave-ho 'tweak' as the arched family crest is aligned using a fork lift. Freshly installed and now only awaiting the surrounding stonework. I revisited a few weeks later to view the completed job with new and very impressive stonework. This single gate with a stylised 3D sphere was designed for an old orangery with a beautiful wall. Close up of our orangery gate. We make all our gates and railings by hand and using traditional, hot forging techniques. Almost too many irons in the fire here! Red hot steel or iron is hammered into shape by hand on anvils. Individually, painstakingly and time consuming, - each bar needing shaped is hot forged. Gate designs are drawn out by hand on the bench and the components made to fit and inserted. An Oxy acetylene torch can be used to heat up and shape specific areas within a design. Making a complex curved panel. Our workshop is not large and can quickly become overtaken by one project. Alongside the hot forging we use an assortment of welding techniques depending on the application. MIG welding for general purpose welding. TIG welding for the fine touch. Arc or stick welding for site work. This customer wanted a well spider's web well cover complete with spider, frog and leaves. Detail of the large, solid spider on the well cover web. Detail of the frog facing the spider across the well cover. Fitting some ornate balcony panels on a summer's day. Ornate balcony panels almost completed. The happy customer doing the 'lean-on and admire the view' test to his new balcony railings. Curved balcony railings with supporting springers and integral lamp posts. Some less ornate terrace railings following a gently curving wall. End of the day daffodil. Our personalisable, side entrance tree gate, - in this instance with the customer's pigs beneath. Our tree gate, in this example with the customer's children and dog beneath. Close up of children and their dog. Heavy and wider tree gate with oak tree central panel. This lady wanted herself seated in the tree within the gate and holding a baby dragon. Close up of her and her baby dragon. This arch topped gate has irregular spaced vertical bars with hot forged 'nail head' details atop. Forged Nail Gate close up. A similar gate within a brick arch but with an organic vine growing up through the gate's more geometric bars. Another side entrance gate with a stylish peaked top in place of the more traditional arch. A standard garden gate with a heavy weight construction and inclusive house number in slate. Another standard garden gate in medium weight construction with inclusive house name and badger design. A small and narrow side entrance gate with the customer and his dogs in a panel. A traditionally scroll panelled, heavyweight side entrance gate. Close up showing the thickness of the scrollwork. A heavyweight, nicely balanced pair of garden gates. Nice shadow from the other side. And a side entrance gate to match. Detail of the central scrolls. Fresh out of our workshop heavy, hot forged arch for customer's existing oak gate. And the installed arch over the customer's oak gate. Detail showing construction of the arch scrolls and spikes. A freshly installed arch topped pair of gates combining a traditional geometry with organic hot forged panels. A final once-over before we leave. Matching panels for wall eye windows. A hollow spherical forged tree to match our Orangery Gate. Detail of the forgework within the sphere. Curving, rising, non geometric handrail. Close up of spiral end. Evening shot of matching undulating railings. Hanging the first of a pair of very simple, square and spike topped, 'keep out' gates. Installing the below ground automatic openers. End of the day eyeing up the gate alignment. Simple double gates with an arched top and spikes. Simple handrail going up brick steps. Installing a pair of access handrails for a couple needing the extra stability while going up their steps. The happy couple posing afterwards. Another very simple access handrail attached to wall where the steps posed a stability problem. A very small hoop topped railing curving around a fish pond. A very long, multi tiered and ornate panelled handrail installation. A just completed long, stepped and curved set of simple, vertical bar pattern railings. Typical re-instatement of London panelled railings that were removed during WW2. Country house railings with 3d forged plough inclusion. Typical Juliet or Spanish Bow Fronted balcony handrail. Tea break during the installation. A pair of large square, hollow section gates. A pair of large, solid, heavy and ornate gates with matching brick piers, walls and dwarf railings to both sides. A side view of the setting sun through these gates. A small, heavy, locking side gate to match the customer's large pair. A small, lightweight and latched simple back garden gate. The first tentative opening of a very large and ornate pair of gates after a long and wet day. As we keep saying, all of our work is individually designed and manufactured to your requirements. If you think we can help with your ironwork and installation ideas, then please do not hesitate to Contact Us.